I love topinambour, for their quirky shapes as well as their earthy smell and somewhat different, slightly sweet taste. Delicious are they in a cocotte or pureed as a side dish and just as wonderful are they as a soup. Unlike a chunky vegetable soup or earthy legume soup, we rarely have only a creamy soup for dinner. I don’t find it substantial enough, unless you eat a huge bowl or two, which makes it too rich. So I’ll normally serve this soup as a starter and then follow up with something like maybe a warm salad or chicken filet with a tomato sauce. See also Zlamushcka’s version of a topinambour soup. Peel the topinambours and the sweet potato and cut into slices. Peel, chop the shallots and sauté in some olive oil until translucent. Add the sliced the stweet potato, topinambours, the stock, the bouquet garni and let it simmer for at least 30 minutes or longer. The topinambours needs to be well cooked and very tender. Take off the heat, remove the bouquet garni and mix until smooth and velvety, adding milk or cream to your preferred consistency. Heat up gently, add some lemon juice and salt and papper to taste. Serve in warmed bowls and finish off with a drizzle of fruity extra virgin olive oil and a a turn of the pepper mill. Serve warm with toasted bread triangles or a grainy baguette. This is an entry for WHB nr 111, hosted by Kalyn at Kalyn’s kitchen. For more info on weekend herb blogging read here. As always, your photos and composition is lovely. Very interesting vegetable. Your photos are wonderful and now I’m getting hungry! Visits to your Blog have helped to inspire me to start a new Blog of my own on a similar theme. This looks like a lovely recipe (and I love the bean pots/soup bowls as well). 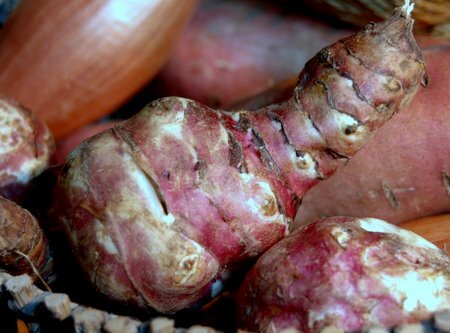 Do you have any tips for reducing the explosive qualities of Jerusalem artichokes? I just discovered Jerusalem Artichoke this year and they are so wonderful. The soup you have is really wonderful! Thanks for the great photo showing what they look like. This is something I’ve never tried and I’ve been very curious about them. The soup sounds just wonderful! I love your little soup pots Ronell. And the soup looks sumptuous. Oh this is so funny, I made almost a similar soup twice last week. I cannot get enough of topinambours. Aren’t they just the best, under a pretty unattractive attire? Looks delicious. Oh, I am so happy there are other Sun root fans. I will definitely try this one out! Looks great. I just made a Jerusalem Artichoke salad and was going to try a soup this week but needed a recipe…. thanks! Beautiful pictures. 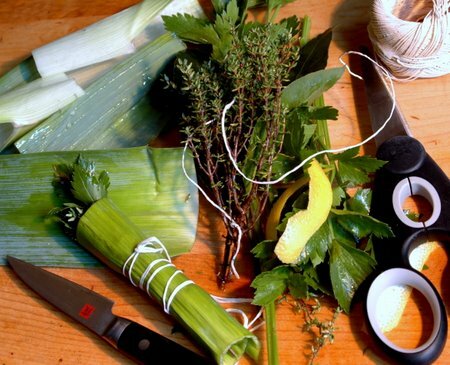 You sure make a beautiful bouquet garni, and the soup looks very tasty. I’ve never seen jerusalem artichokes and sweet potatoes combined in a soup — excellent idea! Mmmm, looks wonderful. 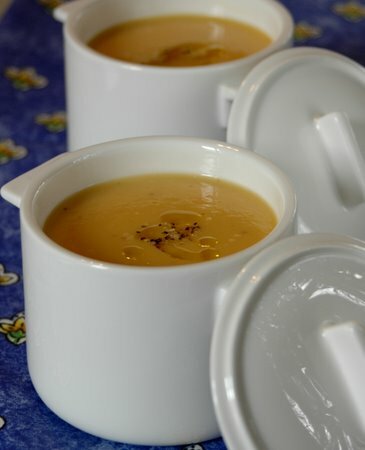 I also have a lovely recipe for Jerusalem artichoke soup on my blog that I make every year. I count down the days till they come into season! !